The third JRT poll was lengthy and, not coincidentally, was left up longer than usual. I like the poll to get as many votes as possible. Having the poll up for a month or so will be the norm until the Jawas say otherwise. After Amazon's recent behavior, I became curious where, if not Amazon, would readers purchase their Macmillan titles? Which of their regular haunts would they be visiting? Did pulling all Macmillan titles even affect some readers who don't even shop at Amazon? My quest to discover where you readers go for books was the subject of this latest poll! Since you were allowed to pick multiple answers, the results are based on where JRT readers shop the most overall (60 total votes--our highest number of participants yet!). Weekend Discussion: JRT To Host Its First Reading Challenge! I'm spilling the beans earlier than I'd normally planned because preparation takes time. You may have read about the upcoming reading challenge I have been planning for JRT either from hints here or at Book Love Affair (thank you, TJ!). It's not just a rumor--I really do plan on hosting an epic challenge that spans the months of May through August (when JRT will have its one year anniversary!). In light of the season and inspired by the amount of new book series I found myself in possession of, JRT's first reading challenge will be called: Summer of Series! 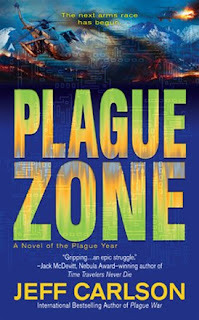 In Plague Zone, Jeff Carlson uses the last few pages of the first chapter to revisit what’s happened in the previous two books. Usually, these kind of summaries bother me, but in this case I was glad. It’d been so long since I read Plague War that I’d forgotten exactly what happened. Plague Zone not only filled in the gaps, but delivered where I felt the previous two were lacking. Having stopped the widespread distribution of yet another evolution of the machine plague that first ravaged across the world, Cam, Ruth, Allison, and Eric have set up camp in Jefferson, Colorado (named after the former US President), hidden away from other military forces who would still arrest, at the very least, Cam and Ruth, for their direct involvement betraying and sabotaging US Military efforts to unleash the third machine plague. Where Plague War was political, Plague Zone is more action-packed with an additional, fear-inducing element. When a lookout from Jefferson spies a lone wanderer edging closer to the city limits, he sends Allison with a small team to investigate. Partly to ease the growing tension between her--now his wife and pregnant with their child--and Ruth, his former object of lust, and partly to delegate, Cam is more preoccupied with an upstart ant invasion that threatens to cause more damage to their already tenuous living conditions. His attention quickly alters course when screams and gunfire alert the citizens of Jefferson that the city is suddenly under some kind of attack. It isn’t Russian or Chinese forces bearing down on Jefferson--it’s an even more pressing and dire threat: the wandering refugee is slack-jawed and white-eyed, shuffling toward the city with an eerie momentum. Suddenly Allison’s small party begins dropping and convulsing, jerking awkwardly against their own bodies. It isn’t until Ruth realizes what’s happening does she try to keep everyone else from saving their crew; a new nanotech plague has been unleashed and it renders its victims into zombies. 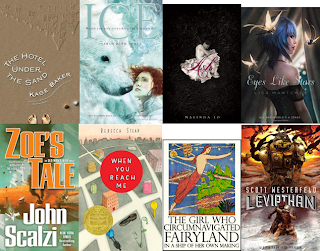 Most of these are SF/F, which will appeal to a lot of you! Alice Howland is a respected Professor of Psychology at Harvard University. Her research has earned her a distinguished position in the literature of psycholinguistics; her publications have become cornerstones of knowledge in her field; her speeches and lectures are in high demand, allowing Alice to remain active in travel. She’s married with three adult children, is 50 years old, at the height of her career, but can’t remember simple words during lecture, forgets to board a plane, and loses her way on a run back home. In just a few short months Alice is diagnosed with early on-set Alzheimer’s Disease. The rapid decline of Alice’s condition is heart-breaking and alarming. Lisa Genova’s expertise as a Neuroscientist gives her a unique perspective on the science of Alzheimer’s; her personal experience with the disease gives her an emotional understanding. The narrative is painstakingly verbose with the language of neuropathy, cellular biology, and pharmaceuticals. 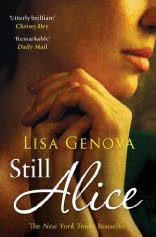 It’s clear from the beginning that Genova’s own knowledge fuels Alice’s scientific rationalizations. In fact, Alice’s husband is a cancer cell biologist; her son, Tom, is a surgeon--what better excuse to exercise the clinical lingo of Alzheimer’s than between fellow scientists and intellectuals trained around the words most of us feel we need a translator to understand? While these characters justify the liberal application of unforgiving, medical descriptions, I couldn’t help feeling the narrative suffered more from this than it benefited. This Weekend Discussion is a day early and just in time, too! 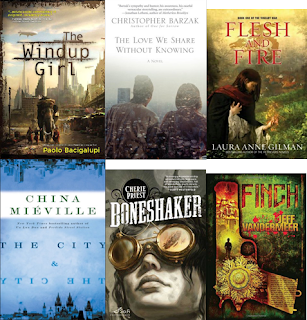 If you haven't seen by now, the Nebula and Andre Norton (YA SF/F) award nominees have been posted. I don't normally pay attention to award winners after the fact--not because I'm obtuse and refuse to acknowledge their merits, but because I don't want to read a book just because it either won or was nominated. I'm sure that's a perfectly good reason to be curious about a new book and then find great new authors, but I like to be drawn to the premise and writing of what I want to read and not the accolades. That being said, I do usually note who gets awards or which books get nominated, even if I don't use those criteria when deciding what to read. This year, I'm pretty surprised to note: I've read about half of the nominees! I've read The Windup Girl, The City & The City, Boneshaker, and actually only bought Shriek because I was so eager to read Finch (it's a sequel, but both sound very, very good)! My verdicts? I really loved all of them. I've read Ash, Eyes Like Stars (I recently reviewed its sequel, out in May: Perchance to Dream), Leviathan, was reading the Valente title, but had to stop because frankly, I don't do well with reading for extended periods on the computer and it's been posted online as an e-book (when will it be in print?! ), and I do currently plan on reading Zoe's Tale before my giveaway ends! As with the previous verdict: I loved these, too. The only title I've been curious about reading that I haven't gotten to yet is Ice by Sarah Beth Durst. Forgive me if this review isn’t as clear, eloquent, or cohesive as I’d like. I have a cold and am having a little trouble concentrating. Also: there are no spoilers in this review. Eyes Like Stars left readers at the mercy of a crossroad--which would Bertie chose: Nate, the salted and sun-bronzed pirate from The Little Mermaid, or Ariel, the mysterious and alluring wind spirit from The Tempest? With Nate kidnapped and taken to Sedna’s lair deep under imaginatively dark and murky waters, Bertie, encouraged by his return to the Théâtre Illuminata, takes Ariel and her fairy friends with her on a caravan ride to The Outside to rescue Nate. The question remains: will she fall for Ariel along the journey and forget about Nate or will she do the impossible and rescue her beloved pirate from a place where only the dead live? You may remember, I wasn’t too keen on the romance between Ariel and Bertie. She should, I thought, be with Nate. He never manipulated her; he’s steady where Ariel is mercurial; dreamy and burly instead of elusive and dependent on magical charms. It’s undeniable that both stand at opposing sides, polar opposites that war for Bertie’s attention. The two were largely a most welcome distraction while Bertie began her search for her real parents and ultimately became entangled in what has always been Bertie’s story. Three years after the Diego War and the “mind-rain” that followed, the world has turned upside down: the stratified social order separating and elevating pretties from uglies and crumblies is no longer enforced. Instead, Tally Youngblood unleashed a new order. Pretty surgery is no longer mandatory, it’s optional--as is the choice to remain unchanged. Without the old system, the world struggles to find ways to organize themselves around each other (they must, of course, have some type of order and classification; humans need to label and categorize). In so short a time, the term Pretty now suggests “whatever got you noticed.” (p. 8). In Japan this means the reputation economy. In a world filled with, and navigated through, social media and networking sites such as Twitter, Facebook, Myspace, YouTube, and thousands of blogs, it’s not surprising that an author as astute as Scott Westerfeld decided this would make a great premise for a SF book. As an addition to his Uglies series for Young Adults, it’s become my favorite of the four. It also makes me a little self-conscious about using social media. The reputation economy works by ranking citizens for doing nothing else but writing short, 10-minute media presentations--pseudo-journalistic style--about what other people are doing (this is called “kicking” a story) and seeing how popular that story (and the kicker) gets. The more attention a kicker regularly receives, the higher their rank overall. Higher ranks grant access to top notch apartments, clothing, and other things that bring materialistic comfort. The idea that people essentially get rewarded for sitting in front of a wall screen (i.e. a computer in our reality) and, to put it in our terms, blogging, texting, or tweeting, is frightening. Although, who wouldn’t love to get paid, and have a certifiable excuse, for a hobby is beyond me. 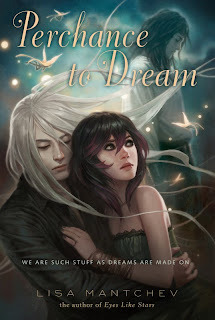 I'm trying another new thing (2010 is all about new things): splitting my Book Faeries posts in two. It worked well last month, so I think I'll do the same from now on. At best, you get two posts per month; at worst, nothing changes. Even if love isn't in the air, romance is something that most readers can appreciate in their books. Whether you swoon over Darcy telling Elizabeth how much he "ardently admires" her, or find yourself getting drawn deeply into the dangerous and deranged obsession that is Bella and Edward, there's a little bit of love for everyone in the world of books. What's your favorite bookish romantic couple? 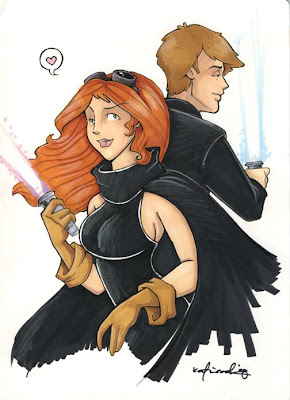 I think mine would have to be Luke Skywalker and Mara Jade. Have I read The Scarlet Letter by Nathaniel Hawthorne? Yes. Do I remember any of it? No. Did that affect how I enjoyed Hester? Absolutely not. Paula Reed picks up the narrative of Hester Prynne and her daughter, Pearl, during the years Hawthorne, at the end of The Scarlet Letter, tells his readers she was in Europe, returning later to America without Pearl; Hester: A Novel explains why. There are so many factors to consider when reviewing a historical fiction novel--more when that novel is a response to a piece of literature. Paula’s Reed prose, for one, is different from Hawthorne’s. The language isn’t as elevated, separated as it is by time and culture. As a response to The Scarlet Letter, Hester is wonderful--the characters blossom vividly from Reed’s writing. I cannot judge whether, as a historical fiction, it merits marks for accuracy (I would hope so). My knowledge of Cromwell’s reign as Lord Protector is pragmatic and extremely beneficial to one thing only: to help navigate against a vast timeline of literature and place certain texts into the context in which they were conceived and received. To put it bluntly: I know about Cromwell because I had to study texts written during the time or that were affected by his rule to get my degree (not history). 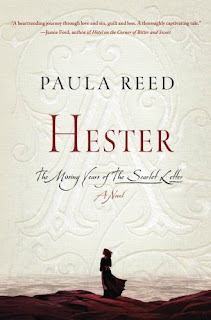 While I enjoyed Hester and thought Reed did an amazing job keeping the timeline of Hester and Pearl’s story concurrent with Cromwell’s and that of the nation, I’m not an educated enough layperson to notice whether she grossly misconstrued events, dialogue, or customs. I do feel confident saying I’m encouraged enough by how accessible (and enjoyable) she made the history to venture forth on my own, using, of course, her characters and their timelines, to measure against the real events and how these imagined people may have fit into reality. I got a little lucky browsing Google Reader this morning! I like this cover. 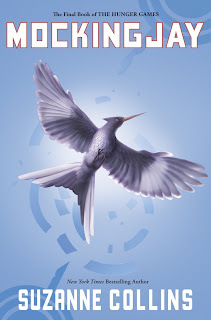 It follows the progression of the mockingjay symbol from a pin (idea), then a costume as the idea rose in popularity and became something tangible, to now the fully realized bird in full flight against the sky (complete with solar flare, a bright sunny day contrasting against the black cover of the first book). The full article from Scholastic is here. Did you know the dark side makes you vomit? 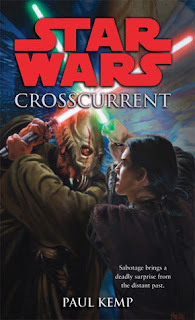 In case you were wondering, Paul S. Kemp keeps up a healthy reminder in his debut Star Wars novel: Crosscurrent. It’s a bit of a crossover with two different Star Wars eras (literally) meeting face to face: Sith and Legacy Era (post-Jacen government). The book opens with more than a few chapters switching back and forth between the past (5,000 years before the Battle of Yavin) and the present (41.5 after). Kemp introduces several characters in both eras, but it isn’t long before I was left wondering when the narrative would connect the two timelines. What does a Sith--who I admit, I am not a fan of--three Jedi, and an Anzat have in common? And what’s the meaning behind a strange vision of a blue-ringed planet and evil pouring from the sky? In the spirit of adventure and magic at the heart of many Star Wars stories, the book doesn’t pick up until Khedryn Faal and Marr Idi-Shael, a pair of remarkably unremarkable fellows, make an appearance--a captain and his copilot with a modified ship (a YT-2400), a penchant for gambling, a dislike of droids, a generous dose of banter, and a heavy resignation when a Jedi approaches the pair wanting to hitch a ride. They’re no Han Solo and Chewbacca, but the pair is cute and manage to drive the novel past the 82nd page. Up until this point I was getting frustrated and concerned that my dislike and avoidance of all things Sith-related was going to unfairly influence how I read the rest of the book, regardless of what happened. Ancient feuds, wayward Padawans, and Sith artifacts do not concern me nor do they grab my attention. Not to mention all of this Harbinger and Omen nonsense was fiddling with my notion of the organic “Ship” Ben found and this new, quite clearly, mechanical war machine and part-time harvester droid carrier. You see, the two, in my head, were quite the same thing. Once I got that straightened out (believe me, I know the difference now), I was able to make the necessary connections and leave Omen for FOTJ to concentrate on Harbinger. There are a lot of authors being published right now, but usually new readers gravitate toward those with the most popular (i.e. best-selling) titles--the risk of not liking a book is tempered when friends, family, or the nation--people we trust (relatively)--recommend it. Our wallets and/or time is invested a little more safely, but we might miss out on a fantastic new author this way. Readers don't always stick to what they're comfortable with, though. Trying a new author can be as much fun as starting an amazing new series (the two often collide), but where do we begin? What makes you decide to try a new author? Is it an interesting premise? Recommendation from someone you know? Do reviews help? Does the cover or title have anything to do with your decision? 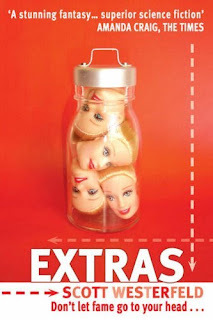 What about cover blurbs from authors you have an established reader relationship with? ...Or is it all of the above? REMINDERS: Vote in the new poll! Where do you usually get your books from? 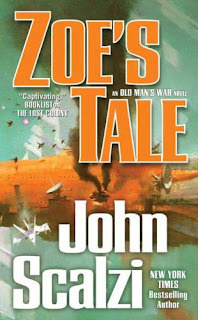 And don't forget, you can enter to win a copy of John Scalzi's Zoe's Tale until March 11th! Unwinding is the final solution agreed upon by both sides of a long, brutal struggle over the issue of abortion: The Heartland War was the culmination of years worth of animosity, religious and personal beliefs, and the obsession to be proved right. With the U.S. military stuck in the middle, charged with keeping either side from completely killing each other, the ludicrous idea of resolving pro-life and pro-choice concerns revolves around the process of Unwinding as dictated by the Bill of Life: “...human life may not be touched from the moment of conception until a child reaches the age of thirteen...between the ages of thirteen and eighteen, a parent may choose to retroactively “abort” a child…” (Unwind, no page specified). Unwinds are anesthetized and surgically cut into reusable parts: eyes, limbs, organs, hair, or vocal chords; they are not put to sleep; they do not technically die. 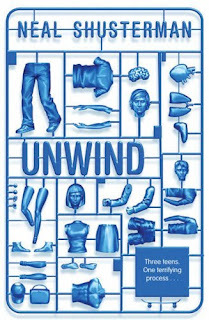 To buy into Neal Shusterman’s fiction, readers have to believe a human can remain conscious as their body is cut to pieces and then those parts, which are used as sellable replacements, have “muscle memory” (p. 14)--an arm belonging to a musician, grafted onto a new body, can still play an instrument as well as the original owner; brain sections retain a noticeable consciousness that’s more intrusive than helpful. Readers also have to believe that the two sides, pro-life and pro-choice, would allow their own convictions to get so out of control, so righteous, and so angry, that they would accept the military’s terms and sentence millions of teenagers to a fate where they are dehumanized as persons, reduced to meat--all in the spirit of compromise wherein everyone loses. Hazel lives with his smaller brother, Fiver, in the Sandleford Warren with lots of other bucks and does organized around the Chief Rabbit and his Owsla (a group of guard rabbits). Fiver’s a bit of a prophetic and has odd, sometimes unintelligible visions. One such vision is of a terrible danger coming to the warren and in his fear and conviction convinces Hazel the Chief Rabbit must be notified. In order for the warren to be safe, an evacuation order must be made. Unfortunately, neither Hazel nor Fiver is believed. However, hope is not lost: one by one rabbits start to appear in support of Fiver and are willing to follow the two in their journey to escape the unknown danger and start their own warren. Along the way they run into rivers, foxes, gulls, mice, cats, a dog, traps, unknown devices made by man, and strange new rabbits. That’s not too coherent, but in a nutshell Watership Down can be broken into a few parts: fleeing the warren, settling into Watership Down, needing does to fill the Honeycomb, and the journey that takes them to hell and back just to get some, as Kehaar would put it “mudders.” It can’t just be about that though (well, it can be, but it isn’t), and so the adventures of Fiver and Hazel are enormous and test the very strengths and weaknesses of lapine endurance, friendship, and ingenuity. Initially, the group sets out with 10 additional rabbits (even the Chief Rabbit’s nephew comes along) and grows, by the end of the book, to 32, plus kittens (baby rabbits). I thought keeping track of twelve rabbits with distinct personalities and dialogue was hard to do. Richard Adams kept throwing more into the mix! To make it even better (or worse, but really he’s adorable), there’s also Kehaar, a gull with an Austrian accent Hazel and Fiver’s warren befriends, and an unnamed mouse companion. The large cast of characters aside, Hazel and Fiver have a lot to contend with themselves as they cross the wide unknown, but they have a few advantages on their side: bravery and open mindedness. Those are, I think, two of the most powerful ideas behind Watership Down. As the group first sets out, they encounter their first obstacle: a small river. There’s a lot of confusion, wariness, and a bit of despair as the rabbits feel the limitations of their own traditional methods of travel. Everyone is tired and afraid; no one wants to cross, even though they can swim perfectly well; no one wants to leave little Pipkin and Fiver--the youngest and most exhausted of the bunch--behind. With a little bit of ingenuity and some convincing, they fashion a raft out of a piece of driftwood and float the pair across. I make it sound more simple than it actually was (in one sense, it’s quite simple). That’s the beauty of Richard Adams’ writing: he turns a small river crossing into a test of skill and intelligence, the first challenge that forces the rabbits to act in very un-rabbit-like ways to save themselves. They confront their sense of propriety and overcome expectations in this, only the first obstacle to reach Watership Down. Hazel and Fiver’s group are pioneers and radical in their ideas and methods (does aren’t the only rabbits that can dig out a warren). They go against tradition but never once compromise their integrity or resort to fighting when talking will do just as well, if not better. Everyone is kind and patient, but most of all: welcoming. Adams invites a contemplation that goes beyond rabbits pulling down a hutch door. Their efforts are appreciated long after we stop to consider the absurdity that Adam has imbued with such gravity. The actions of rabbits are on a rabbit-scale; Blackberry and Bigwig (my favorite, aside from Kehaar) have tackled a new, strong adversary and won. In thinking of their feat we must consider a time when we, too, have felt the pause of success Adams refers to. As the moment comes to us, finally we understand and so believe in their courage. As the door falls, we may see a little rabbit in ourselves--that part of us that, like those of the Honeycomb, is all “warm hearts and brave spirits” (p. 279). 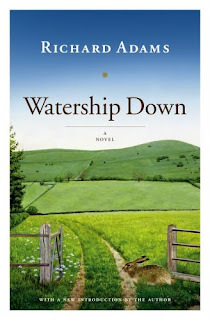 If you haven’t already read it, I highly recommend Watership Down. How many Jawas recommend this book? Don't forget to vote in this month's poll or enter JRT's Macmillan Giveaway! I wish I could afford to make it an international contest* (see below for possible international participation) or give out a bundle of Macmillan titles, but it's going to cost me half what I paid for this book just to ship it out to the winner (postage & packaging).